Stephane Humbert Lucas, perfumer behind SoOud, which made its debut at the Elements Showcase, aims to marry French and Arabian sensibilities in perfumes that meld European elegance with Arabian sensuality. 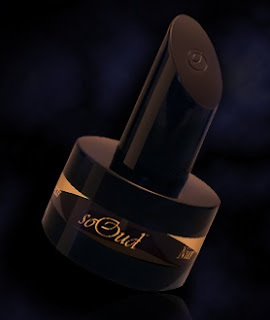 Although not all of the perfumes feature notes that are typically “Arabian”, the overall aesthetic- from the packaging, with it’s clear slit circling the middle of the otherwise opaque bottle, clearly an abstraction of the niqab, to the heavy density of the scents- leans way more towards the East than it does towards Europe. Fam, meaning “The Mouth”, is a powdery floral. Rose, pepper and saffron are prominent, as are sandalwood and musk in the base notes. Kanz, “The Treasure”, is the male counterpart to Fam. Oud, nagarmotha and sandalwood provide a woody backdrop against which the softness of rose and the more angular sweetness of jasmine are highlighted to a degree that might make this fragrance more suitable for women than the male audience for which is was intended. Asmar-“Dark Brown”- notes of Arabian coffee, honey, cloves and tobacco add spice and earthiness to the thick sweetness and ambered warmth of raisins, heliotrope, amber, vanilla and musk. Asmar is classified as a “woody amber” and is the only one of the oud group in which carnation is the featured flower. Burqa- The woodiest of the four “oud perfumes, though rose, amber and patchouli very much help to define it. Each scent is available as Nektar or in the less strong Eaux Fines concentration. This line has stirred up some political/social controversy. For those interested, see the comments on 1000 fragrances. I'm glad you added the link to Octavian's blog- the comments, particularly that of Eleven European Mystics (who is now deceased), are very enlightening. I also find this brand disturbing. Glad I live in a culture where I can decline to buy this product without fear of physical abuse. I enjoy Octavian's blog very much. Everyone go check it out! I love Oud. I'd try most Middle Eastern styled scents in a heartbeat. But I do want to say that as I read this I felt troubled, then a bit disturbed...that sinking I'm not sure I could do that feeling. The marketing strategy seems to be wanting to capitalize on "mystery" and "hidden"..which in my perspective is about the suppression. I just didn't feel the joy in this kind of hiddeness. But I have also been put off on the styling of Tom F. I'm sure this is going to generate lots of interesting commentary, I wonder who the perfume audience ultimately is and whether the strategy "works" for that audience? I didn't know about Eleven European Mystics. :-( Very sorry to read this. I'm with Marina. Nez a Nez? Pass. I am also very saddened to hear about Eleven European Mystics. I agree with Cheryl...I am put off by both extremes...and I think it's done more for shock value than any kind of artistic statement, which is even more annoying. I am neither a prude or a bigot, but I won't be buying a scent advertised amid faux genitalia nor one called Burqua any time soon, although it does make me extra glad that I, too, live in a culture that will not hang Mr. Ford for his ad campaign. The first three sound nice. I, too, am so sorry to hear about the death of Eleven European Mystics. She was one of the first people to comment my first review for PST and I remember feeling very grateful. May she rest in peace. Momlady- From what I understand many ME women prefer French perfumes, so I wonder what they'd think of this "hybrid". Also, some religious Muslims don't wear any alcohol-based fragrances so they wouldn't even consider trying these. I'm curious to find out which retailers end up stocking them. Marina- They definitely reminded me of Nez-a-Nez perfumes I've tried. Despite the fact that the name of the line is SoOud the perfumes are more fruity floral than anything else. Anonymous- Whenever I travel I always return feeling more appreciative of my country and its culture than before I left. Cherly- Lucas seems to be going back in time to the same Orientalist mentality that was prominent amongst 19thc French painters. I don't think that "mystery" and "hidden" are necessarily synonymous with suppression but I understand your discomfort, and I shared it. Tammy- When I was talking to Mr. Lucas I really didn't think he was going for "shock value". I think he really believed that the perfumes and the whole ad campaign were a testament to the beauty of women. Perhaps, as a Frenchman, he perceives the aesthetic differently than I do, as an American. I wish I had asked him about that.